As much as I love Monsoon I hate to admit that am not that fond of fried stuffs that’s generally served during the season. I have always averted these as a weight watcher and now that I have grown double in size I still cant make myself love it. Its never regular on our plate rather we indulge in it very occasionally. Cusin brother came to visit us with his family I decided to show some deep fried love as snack, which translated into Bengali’s most favourite piyanji or onion fritter. Ask my Dad, who even after his angioplasty loves to bring home a greasy packet full of telebhaja (deep fried fritters) from his way back from office. Its another matter that now a days he gets a good bashing from all of us and most often than not that packet finds it’s place in the bin. But then we have to indulge him with some shallow fried or baked stuff like this. Though am not very fond of these but this monsoon am going to share some of my favourite deep fries that I like to snack on sometimes. 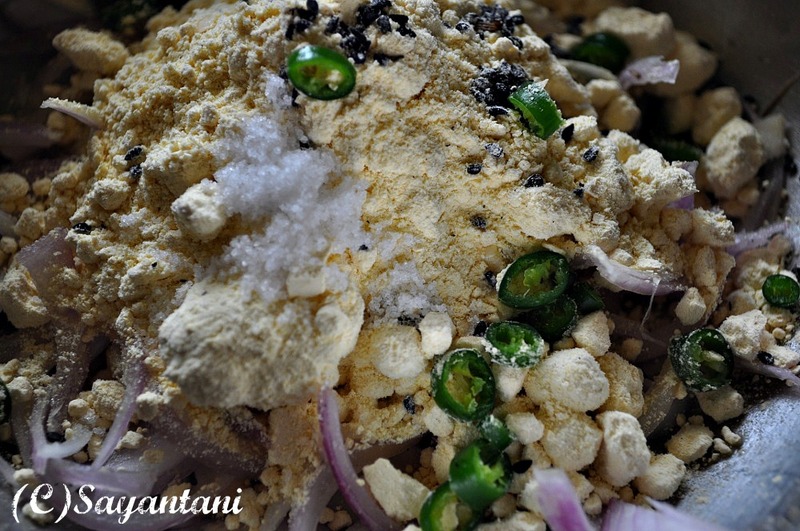 Telebhaja for Bengalis generally refers to any savory item which has been deep fried. 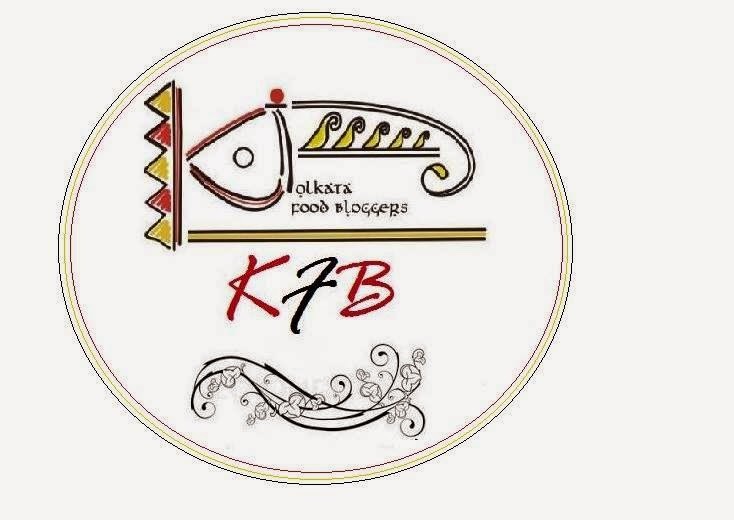 It could be batter fried vegetables like beguni (batter fried slices brinjal), kumro fuler bora (pumpkin flower fritter), stuffed fries like samosa or savory cakes like vegetable chop, fish chops and cutlets. 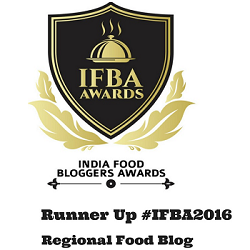 Telebhaja plays a very important role in begali cuisine. Not only is a very significant evening snack but it also is served as an accompaniment for dal-chawal (rice and lentil) during a proper meal. Today ams haring the easiest of all the telebhaja and the one and only piyanji. This is very popular all over the world. 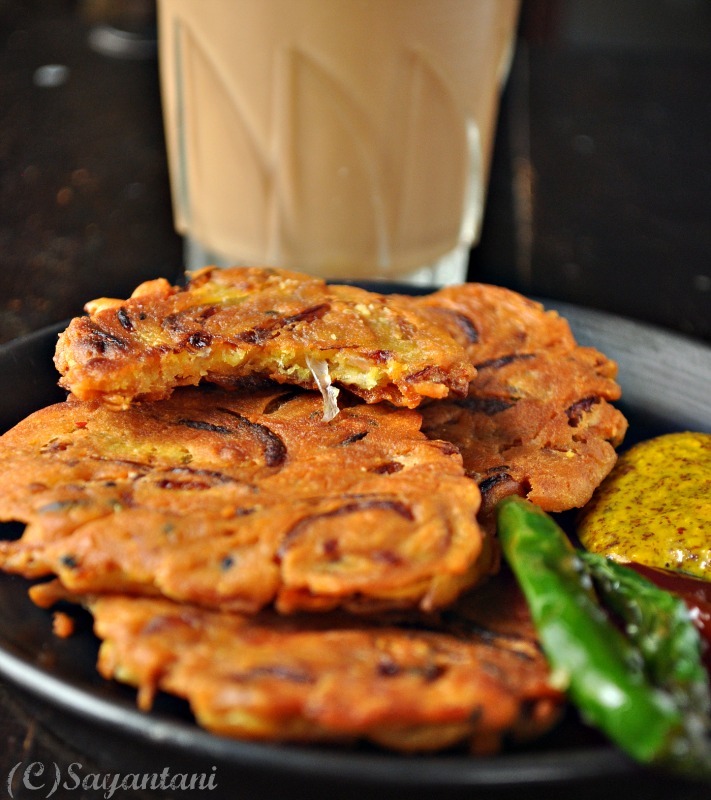 Some call it piyanji, some call it pyaj ke pakode and even some call it pyaj ke kebab, but at the end of the day its onion fritters. 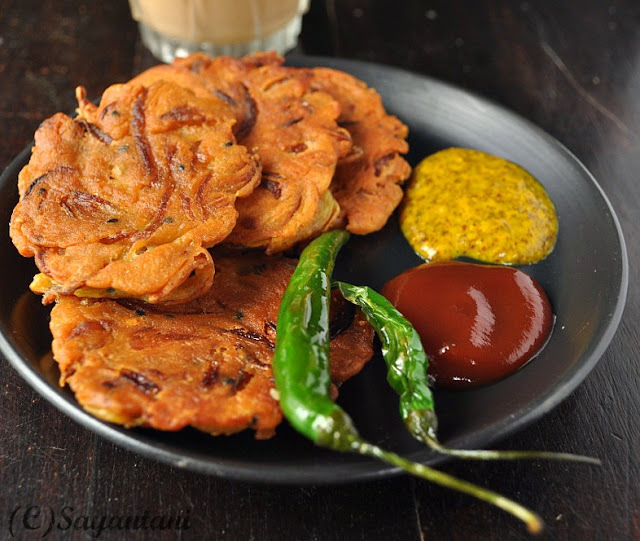 The best part of this fritter is if you are not too much worried about the presentation read the look of it you can actually cook it in lesser oil. In that case fry them in a non-stick pan on very low heat. It would be little charred on the outside but will still taste good. 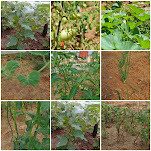 Green chillies: 2-3; totally depends on your preference and tolerence of heat. Wash, peel and very finely chop the onion in half moon shape. Place these in a big bowl and salt. Mash with your hands so that juices start to come out form the onion. 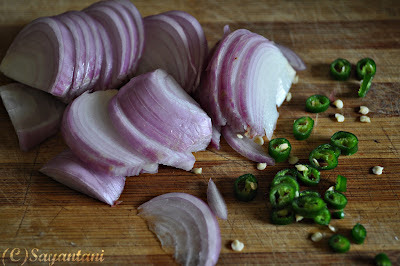 Chop the green chillies very finely and add. Rub the nigella seeds in your palm and add to the onions. Add all the other ingredients except the oil. Mix well and start adding water 1 tsp at a time. The batter would be thick and should coat the chopped onions well. Heat 2 tbsp oil in a non-stick pan and place a table spoonful of the mixture. Keep the flame to medium. After a minute or so turn the fritters and press gently with your spatula to flatten them. Fry till crisp on both sides. Serve out of the pan with ketchup or the way Bengalis love ti with puffed rice and sautéed green chilies. Enjoy with a hot cup of masala tea while the rain entertains you with her beautiful tap dance. Do not make the batter and fry it later. The onions will release lots of water and will make the batter watery. Make it fresh, fry and enjoy. If kids are involved then give the green chilies a miss. Definitely goes to Jagruti's JCO, Celebrate-Monsoon of India, hosted this month at A homemaker's Diary. Also to Kid's delight; snacks. Srivallis monthly event this month being hosted at Cook's joy. fritter. fritters recipe, savory fritter recipes, onion fritters, how to make onion fritters, onion fritters recipe, indian style onion fritters, fritters with chickpea flour, besan ke pakode, pyaj ke pakode recipe, pyaj pakoda, payaj wale pakode, peanji, pianji, piyaji, piyanji, peyanji, peyaji, banagli piyaji recipe, crispy fried onion fritters, apple fritters recipe, pyaj ke kebab, payj ke kabab. when can I visit you ? 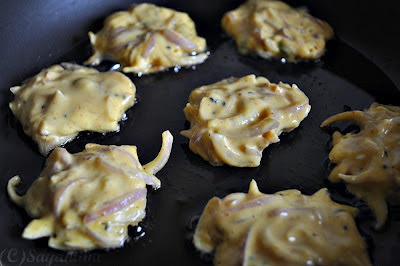 droolworthy and yummy pakora..:-)perfect for your event !! eta ki holo? ta bole piyaji!!! ekhon amar jive jol aasche.. pet sur sur korche.. uff!!! ki korbo? 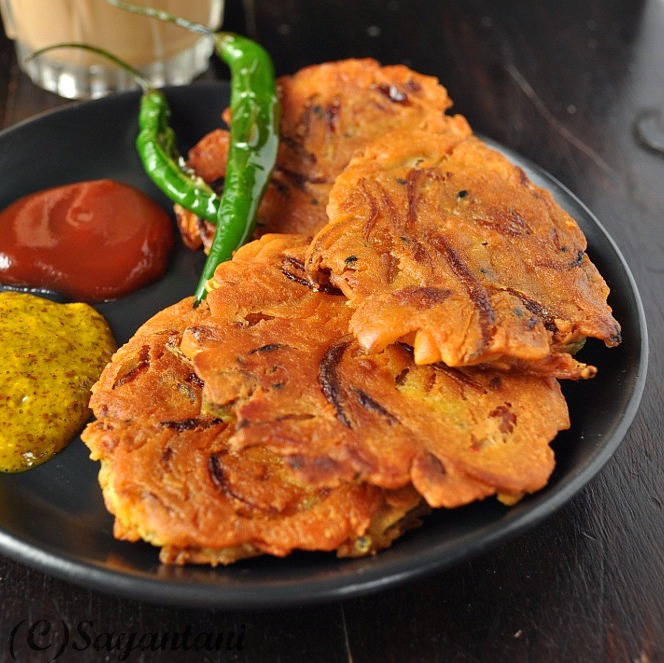 jaak chai khai.. kintu setao to nijeke banate hobe.. :(..
Onion pakoda fried with 2 tablespoon oil. I am in. Love to have it with my tea.Delicious. Nice love the texture !! haa haa haa ei to sei jinish..ja jug jug dhore rosod jugiyechhe koto addar..khide mitiyechhe koto coaching class ferot chhattrer..shakkhi thekechhe koto misti premer..songi hoyechhe koto nisshongo sondher...momer aloy besto hate porikkhar khata dekhte dekhte koto sikkhok paper er bodole khujechhe piyaji..sofay bose cinema dekhar moja bariyechhe piyaji..kagojer thongay nun chhetay ghor borshay probol grisshe kalche korar lalchhe tele jonmo niyechhe PIYAJI..tomare selam!! Just the right ( lets overlook the unhealthy part!! :-) snack for a rainy day. Mouthwatering. Give me that whole plate, drooling here. plz will u give onion fritters with your tea? Yummy and crispy fitters,perfect tea time snack. Sayantani I loved the new header so Bengali! 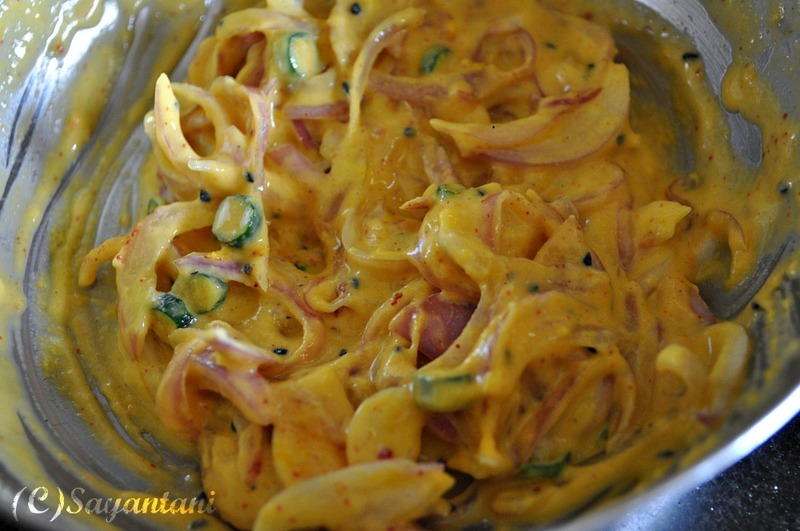 About the Peyaji I make a version with onion and tomato just like this. Makes good for additions to Kadhi too. Wow...Peyajita dekhei jibe jol ese jachhe. Monsoon er bikaler jnyo perfect. :) na na..khete khete prem korar kothat bolini..but piyaji kora ar prem kora dutor bhetor ki kothao mil nei? 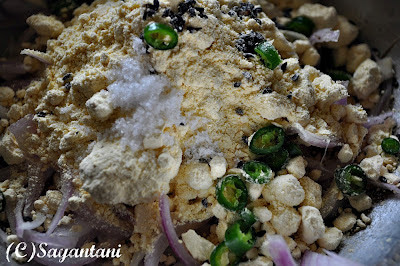 ?prem korar recipe tao to piyaji korar motoi..tai na..? girish park e niranjan dokan ta cheno? devil ar fish fry ta try koro konodin. OH these look so amazing!! Love your recipes! 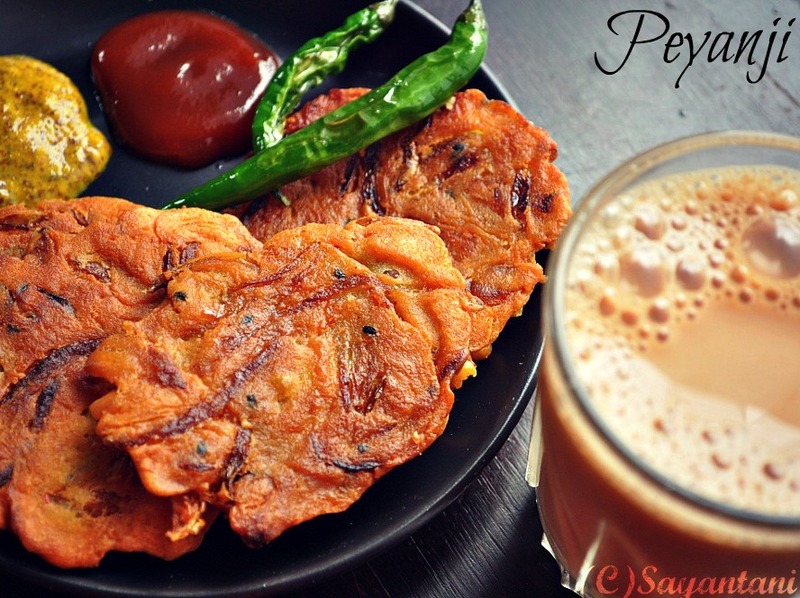 I'm not a fan of fried stuff too, but i cant say no to home made pakoras! These look yum! Healthy way of making pakodas. Thx for linking.